Update: ElfYourself 2014 - click here for the latest version! Elf Yourself is back for 2010! Elfyourself.com is one of the longest running 'viral' campaigns, appearing every Christmas for the last few years, giving internet users the chance to 'Elf Yourself' and send personalised Christmas messages. 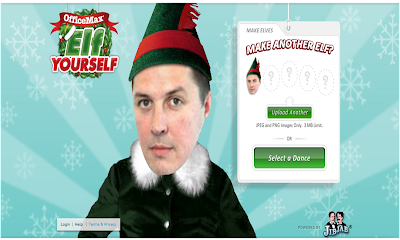 Elf Yourself users can again pay for a permanent version of their creation as well as order gifts (mugs, mousemats etc) that hold the personalised Elf Yourself image. OfficeMax have done this before, but is still entertaining and the Christmas season wouldn't be the same without the opportunity to Elf Yourself!